Estimated shipping times for both of Apple's new iMac models dramatically improved on Saturday, going from weeks to just one to three business days. The changes apply to both the 21.5-inch model and the 27-inch variety, in all of the default available processor speeds. Just this week, the 21.5-inch model was estimated to ship in two to three weeks, while the 27-inch model was advertised to take up to a month to ship. The first signs that iMac availability was improving came in January, when Apple saw its overall domestic Mac sales surge up 31 percent year over year. The new iMacs debuted in December in extremely limited supply, which contributed to a 17 percent drop in sales in the holiday quarter. 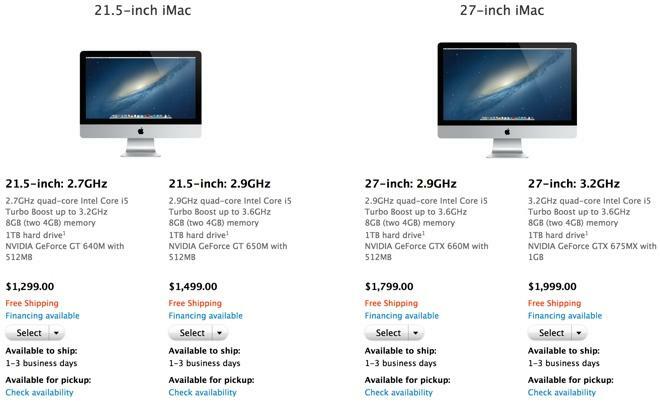 The new iMacs were plagued with production issues when new, thinner desktops went on sale. It's been reported that those issues came from a unique screen lamination process utilized in the design. With shipping times for the iMacs having dramatically improved, any improvements to production could pave the way for a redesigned Thunderbolt Display that would feature the same slim profile as the new iMacs. Apple's current model of the 27-inch Thunderbolt Display has been in limited supply at resellers in recent months, and a drawdown in inventory frequently signals Apple is planning to introduce new hardware to the market. As for the Mac, analysts generally expect that Apple will see sales rebound this quarter thanks to improved availability of the new iMac models. The company also recently improved speeds and cut prices on its Retina MacBook Pro models, which is expected to help boost sales.